Portland's Next Top Bellydance Fusion Model! Ok, so I am NOT Portland’s next top bellydance fusion model, but I got a great story out of this crazy experience! I’m writing today to cover last night’s modeling experience. I just had to share! I was involved in a bellydance clothing fashion show that kicked off the exciting Jamballah NW festival this weekend, a showcase of bellydance fusion by way of vending, shows, and workshops. See the website for more details and how you can experience Jamballah yourself: http://www.jamballahnw.com. Let me set the stage for you: On the main floor was a stage, tables and chairs for the audience, and a bar. Upstairs, a breathtaking array of vendor’s booths filled with the most beautiful things a bellydancer/performance artist has ever seen. Downstairs, a basement hallway filled with clothes, accoutrements and models. In short, the night was very very short! My designer’s booth was bustling when I arrived. I was one of the women representing Sakkara Clothing and Costume, and things were selling even before the show started! Kim (Sakkara) showed me the dressing area, an unadorned but well-lit basement where ladies and men were dressing, stretching, putting on makeup (lots of makeup) and gabbing. Since I hadn’t had time to check out the stage, one of my “colleagues” filled me in on the stage conditions: uneven wood with depressions and a few cracks, and a few outlets sticking up from the floor just waiting to stub your toe. Yikes! We all checked eachother out conspicuously; compliments were passed around about the pretty skirt, funky wrist cuff, awesome harem pants, or furry vest someone was wearing. There was an amazing variety in the costumes. Actually, there were no traditional bellydance costumes from what I saw. It was daunting to observe all that fabulousness in one small hallway. I felt a little plain and small compared to the ladies with the giant Edward Scissorhands wigs and ruffled booty skirts, topped off with tons of glittery makeup and a lacey parasol, of course. Tension rose when the emcee came down the stairs in her giant (and I mean GIANT) red pleather platform knee-high boots and told us it was almost “go time.” If I hadn’t been intimidated before, I was now. Our emcee was an Amazonian woman with a neon dreaded wig, the aforementioned boots, and crazy makeup. She was also very boisterous on stage. When it was our turn to dance, I slithered up the stage steps with my snake arms undulating, excited to show off my moves. Then realized I could barely hear the music. It was a slight muffled thump-thump with an occasional industrial noise. The emcee, though, she was LOUD! I didn’t really know what to do, so I just danced and hoped my moves somehow matched the music. When the other two dancers came on stage I was awed at their ability to ignore the missing music and put on their fake-it-til-you-make-it faces. It seemed that as soon as it started, it was over. After the last dancer, we gracefully (?) pranced off the stage, and it was NEXT DANCER! The nice thing about a fashion show is that there is constant movement, and though the memory of a costume can linger, the time on the stage is limited, and the next flashy thing will be strutting up the stairs before you know it. And no one can deny it is quite a thrill to wear designer duds on a stage, even if it’s just for a few minutes and you can’t hear the music! And check ME out in my custom top, velvet dance pants, and jellyfish skirt by Sakkara Clothing! This picture was taken in the basement hallway before the show. Ah, it was too short, I agree! Thanks so much for being a part. You did great! Big hugs. Thank you for the opportunity Kim! It was an adventure! Do check Kim’s stuff out, Emilie. 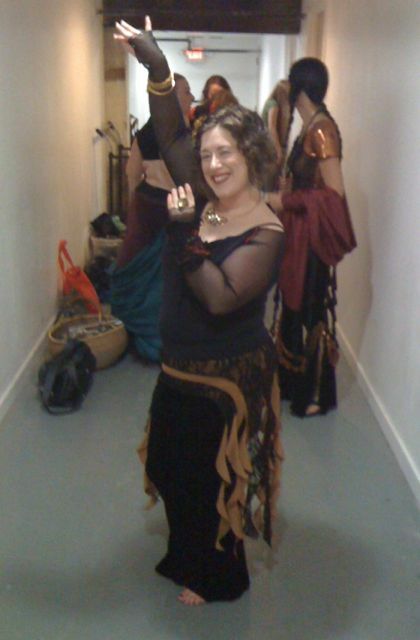 Almost all the pretties I wear to bellydance class are from her!